Pekka Laukkanen began his trombone studies at Jyväskylä Conservatory of Music in 1975 and got, at the time, totally swept away by music. The musical athlete of many sports has played different games in different teams within the Finnish music scene. 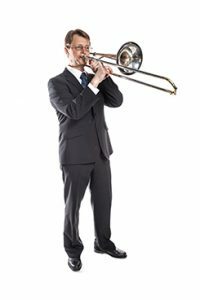 He has studied at the classical and jazz music departments of the Sibelius Academy and worked as a freelance musician, for example in Helsinki City Theatre, symphony orchestras, and big bands. He has been part of the UMO Jazz Orchestra since 1993.